Customization is our specialty. View these pages for ideas and information about customizing your order. Remember, we do it all. So, if you can't find what you've got in mind, call us at 1-800-GO-RUGBY or send us an email and we'll gladly help turn your idea into a great looking rugby shirt decorated the way you want. In-Stock Rugby Jerseys start at $65.00 each. Group orders 24+ are $60.00 each. 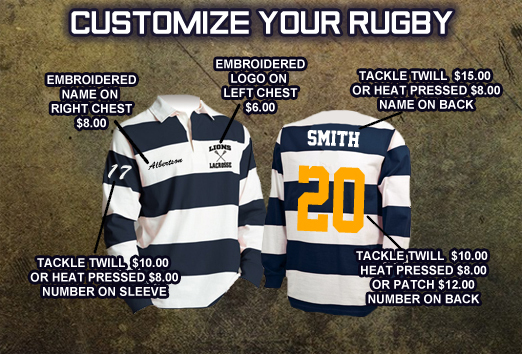 In-Stock Rugby Jerseys that need any of these add-ons typically take 3 to 4 weeks and require a minimum of at least 12 jerseys for decoration. If you need less than 12 jerseys decorated there will be an additional $50.00 surcharge fee. Custom designed jerseys that you have designed from our shirt builder start at $60.00 and require a minimum of 24 pieces. Group orders 50+ are $55.00 each. For your custom designed jersey please allow 6 to 8 weeks for us to process your custom order.